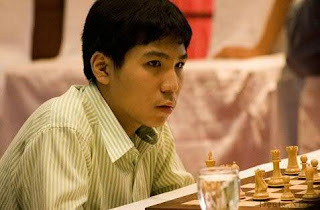 Our very own Filipino GM Wesley So swept his all matches to bag a lone Gold medal of the 26th Southeast Asian Games at the Swarna Dwipa Hotel in Palembang, Indonesia where he finished undefeated with 9.0 points of Chess Blitz Competition. Over-all Philippines Medal Tally on chess competition has 7 medals, including gold in the blitz competition by GM Wesley So. These are the great Filipino Chess athletes with leadership of NCFP Chairman/President Prospero "Butch" Pichay Jr who continue to contend for the glory and honor of our country Philippines: Men Blitz (GM Wesley So, Gold Medal), Men Blitz (GM Mark Paragua, Bronze), Men Standard (GM Wesley So, Silver), Women Standard (WFM Rul Ylem Jose, Silver), Blindfold (GM John Paul Gomez, Silver), Blindfold (GM Darwin Laylo, Bronze) and Mixed pair (GM Oliver Barbosa and WIM Catherine Perena, Silver). Congratulations to our Filipino woodpushers for the great job ever done.